Graphite had been used for hundreds of years to make marks on paper, but the first known illustration of a modern pencil is dated to 1565, when it was mentioned by a Swiss botanist, Conrad Gesner. Graphite was originally glued into wooden holders so that it did not come off on the user’s hands. 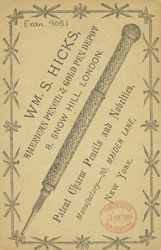 The pencils sold by Hicks were much more elaborate than this.